For me, one of the most important aspects of my career as a software developer is learning. I love to learn new stuff, and I don’t just mean play with shiny new technologies or gadgets; I mean improve my knowledge about the tools I need to use in my work. In fact, I like to learn something new every day! So I thought I would start writing these quick snippets to record the new things I learn each day (assuming that I do in fact learn something new each day!). Because not all browsers (ahem IE…) support console.log() when the debugger isn’t running, you may get a nullref exception! It’s much better to use debugger; – so when you have the debugger open your code will automatically break at that point! 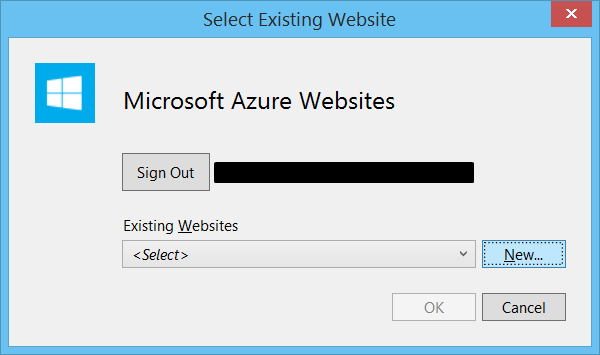 As I mentioned in part one of this 2-part “straight to TV” drama, Azure Webjobs are pretty awesome! They’re Scheduled Tasks without the secrecy. 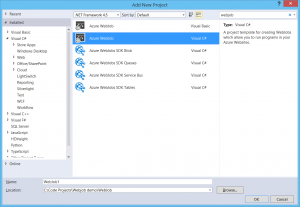 They’re Azure Worker Processes without the cost! You can host them on Azure for free as a Web App (recently renamed from “Websites”) and straight out of the box you get an awesome Dashboard that allows you to check the status of your Webjob and replay any single invocation at a single click. WebJobs are amazing for doing processes that take a decent chunk of time and processing power, so you don’t hold up the your website’s thread and slow down any responses. For the WebJob that I recently wrote, I dump the url and database Id of a pdf file into the Message Queue, and the WebJob grabs the PDF, creates a thumbnail of the first page, saves it back to my Azure Blob Storage container and adds the thumbnail url back into the database – all for free and without freezing up the UI of my CMS. 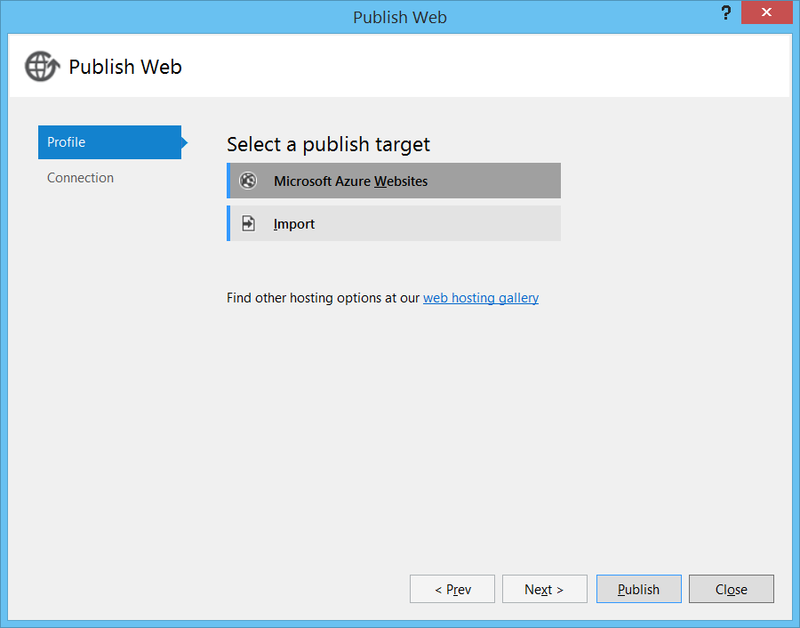 In part one I showed you how to add messages to an Azure Message Queue. 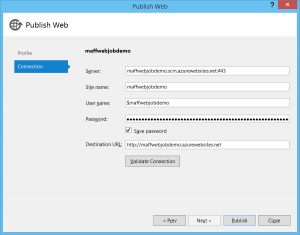 In this post I will show you how you can build an Azure Webjob to process and do something with those messages. 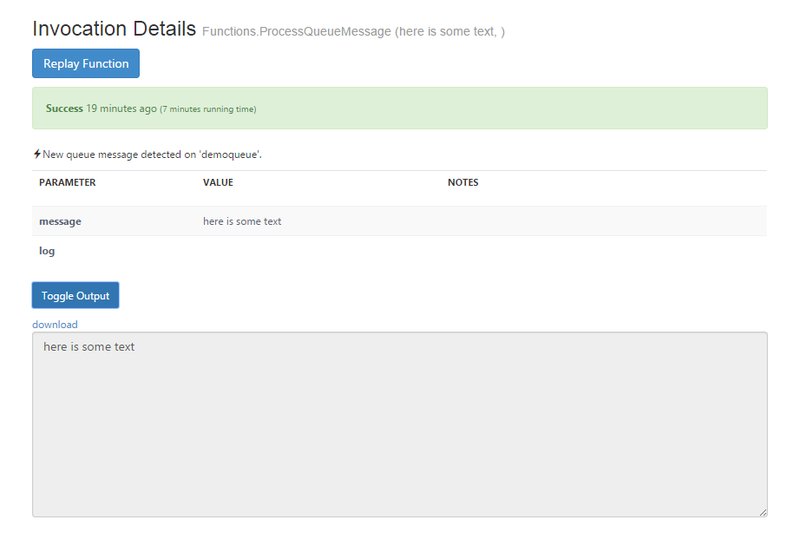 The second parameter TextWriter allows you to write to the WebJob logfile, the contents of which you can view through the Dashboard (more to come on that later) in the same way you would use console.log() in a Console Application. You will notice there are two Connection String placeholders in the App.config file. 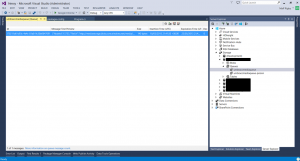 The AzureWebJobsStorage Connection String is the one you want to configure at this point. 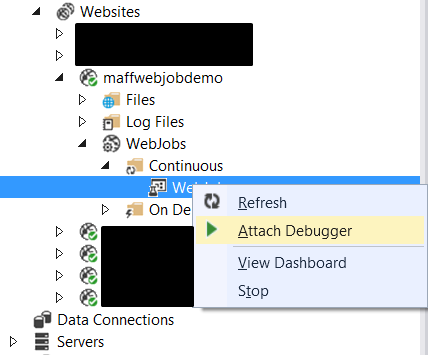 We’ll get on to the AzureWebJobsDashboard Connection String a bit later. Yes it really is that simple to create a WebJob – now you just have to stick whatever code you want inside your ProcessMessageQueue method, so you can process the data that you stuck in the Message Queue in the first place. You can make that bit as simple or as complex as you like! On the next screen that pops up you will see a whole load of options for when and how your WebJob should run (I have chosen ‘Run Continuously’ for this demo) and click OK. 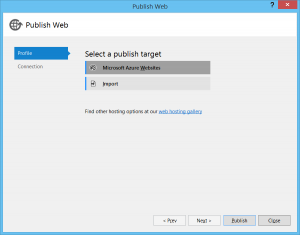 Finally, click ‘Publish’ to publish your WebJob. The first time you publish a WebJob it takes a while, as it’s uploading all the DLLs etc that you’ve created with your code. Any subsequent publishes all seem to be pretty quick so I assume it’s just pushing up any files that have changed since the last publish. 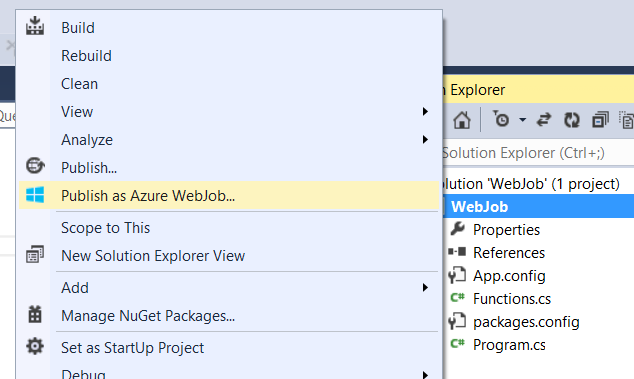 So now we have published the WebJob it’s time to discover a pretty awesome feature – you can attach your local Visual Studio to your remote WebJob and debug it in real time! 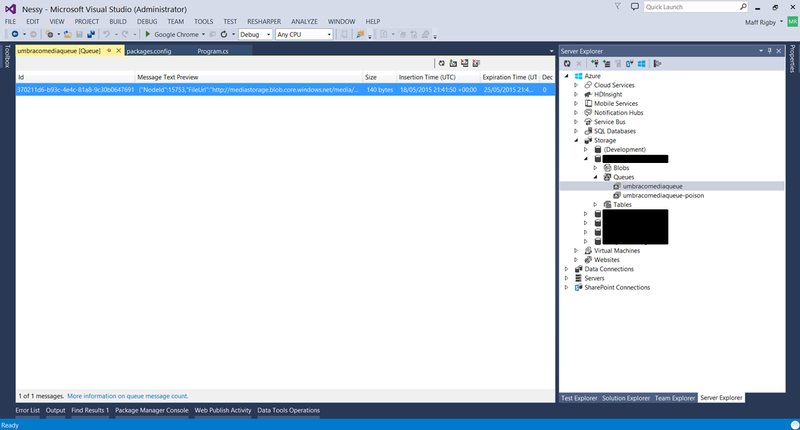 In Visual Studio view the Server Explorer (View > Server Explorer) and you will see ‘Azure’ showing at the top. Expand that and you will be able to see your Storage accounts and your Websites, along with all the other areas of Azure. Yes it really is that simple to set up a WebJob! There’s only one thing left to show you before I go to bed, and that’s how to get the Dashboard up and running. If you can’t be bothered to read all that text I’ll save you the task. Basically you haven’t yet set up the Connection String for your Dashboard. You need to set this in 2 places – in your App.config file and also in your WebJob ‘Configure’ section in the Azure Management Portal. To set the Connection String in your App.config, simply add the Storage Account info in the AzureWebJobsDashboard Connection String (you can use the same Storage Account that you used for the Message Queue, or set up a new one if you wish). Finally you can also replay this invocation by hitting the ‘Replay Function’ button at the top of the screen which re-submits that message back to the Message Queue for you. This is really useful if the function fails, and you want to try it again to either debug it or run it once you have fixed a bug. So that’s a really quick introduction to creating WebJobs – I hope I’ve covered all the basics and you can get up and running with this awesome Azure feature! Let me know in the comments if you’ve run into any issues setting this up, and I will try to help out if I can! 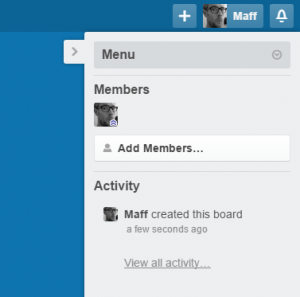 8 Trello Shortcuts that will improve productivity! 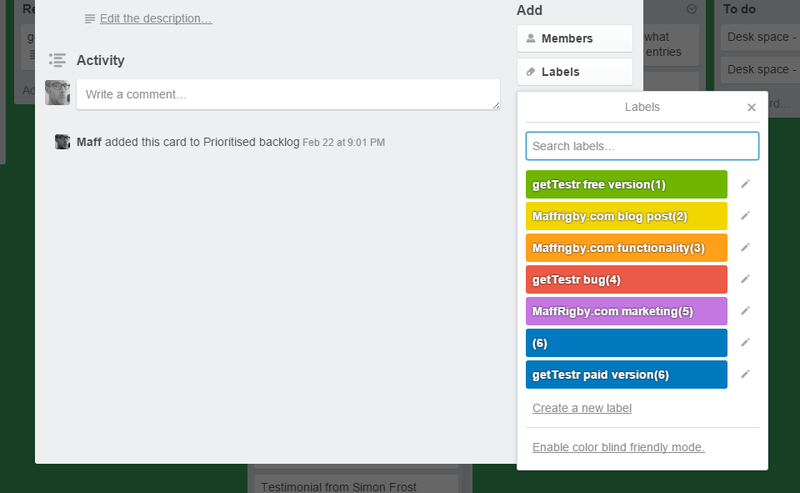 I use Trello for everything! From managing collaborative software projects to keeping personal To-Do lists, to tracking my weight loss! It’s an awesome tool and I love the way it visually helps me to plan and prioritise my life! Furthermore I’m a very impatient person with not enough time to do all the things I want! So I’m constantly trying to find little shortcuts here and there that will shave off a few seconds or minutes from the task I’m doing, so I can spend that time doing more stuff! I was chatting to another developer the other day (we do talk to each other occasionally you know…) and I mentioned a couple of Trello shortcuts that save me those few precious seconds. He didn’t know they existed and he was pretty excited about – he assured me he was going to try them out as soon as he got home! Maybe he was telling the truth, or maybe he was just humouring me and hoping I would just stop talking to him… either way I thought I would share my favourite Trello shortcuts with you, and you can see for yourself how much they improve your Trello productivity! I currently have 14 boards in my Trello and I will switch backwards and forwards between at least 5 of them in any given day. This was the first shortcut I found and I love it! Press B and then start typing the name of your board. Watch with awe as your list of boards appears and is filtered down to the exact board you are looking for. Then hit Enter, lean back and enjoy those extra few seconds you have saved by not having to click on the Boards list, scroll down to find your board and click on it! Free bonus tip: Press F and then * and you will see the number of cards displayed at the top of each list! I found this one totally by accident one day – if you’re in a board and you double click anywhere on the background, the ‘Add List’ dialogue appears and guess what – you can ADD A NEW LIST!!! Shortcut 4 – send your board an Email! I’m constantly sending myself email reminders to do things or links to articles I want to read but maybe later. So imagine my glee when I discovered that you can send an email to your Trello board and it will turn your email into a card for you! Expand the menu bar on the right hand side of the screen, and then click on the “Menu” dropdown at the top of that bar. 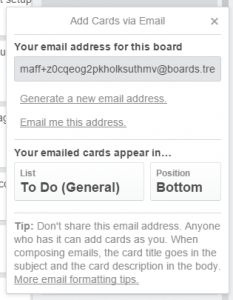 You will see a link that says “Email-to-board Settings” which contains a randomly-generated email address that you can use to send an email to your board. You can choose which list to create the card in, and where you want it to go in that list. 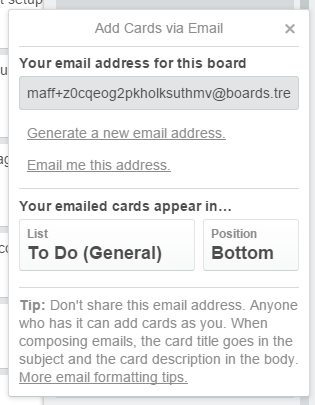 Each board has it’s own email address for each member that has access to it, and you can regenerate your email address (like I did after taking that screenshot just in case you were wondering…) to ensure that only you can email your specific board. The subject of the email will become the title of the card, and the body of the email will be the description. There are more formatting tricks skillz you can learn here if you want to become an ’email-to-board’ Ninja! In one of my Trello boards I have 11 lists! Even on my HD laptop screen means I have to scroll my board to see all my lists, and the right-hand side menu bar just gets in the way! But that’s a simple problem to solve – just press W and the side menu will appear or disappear! Nice. Labels are a great way of categorising cards and giving a visual cue as to which cards belong to what category. When you’re on a card, press L and the Lists menu will magically appear. Each label has a number in brackets next to it. Simply press the number for the label you want, hit Enter and your card will be categorised! 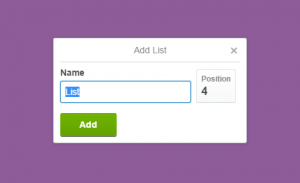 Finally if you have a lot of boards in your Trello and you’re using it through an app, starring your favourite boards moves them all to the top of the Boards list/page and makes it much quicker for you to find the board you want! 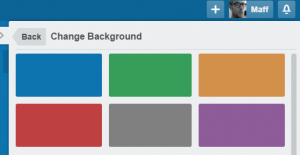 Bonus Shortcut – set Trello as your browser homepage! If you’ve got this far you deserve a reward, so here’s a little bonus shortcut! I set my browser homepage to be my ‘Backlog’ Trello board – this is my prioritised backlog where I bring cards in from all my other boards and stack-prioritise them! So each morning when I open my laptop I can see exactly what my priorities are for that day! 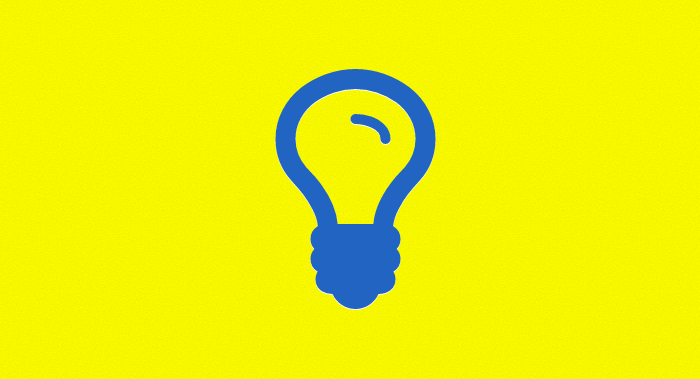 So there you go – if you’re using Trello a lot and you use all these shortcuts I can guarantee that you will save at least 2 extra minutes per day! Just think how many tweets you could send with all that saved time! 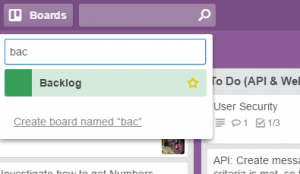 Do you have any other Trello shortcuts that you find invaluable? If so, share them in the comments below! Azure WebJobs are pretty amazing! They’re similar to Azure Worker Processes but with a couple of differences. First they can be triggered by an action – this action is usually the addition of a message to an Azure Message Storage table. Second, they run on an Azure Website (recently renamed to “Web Apps”) and as a result you can run a number of WebJobs entirely for free! 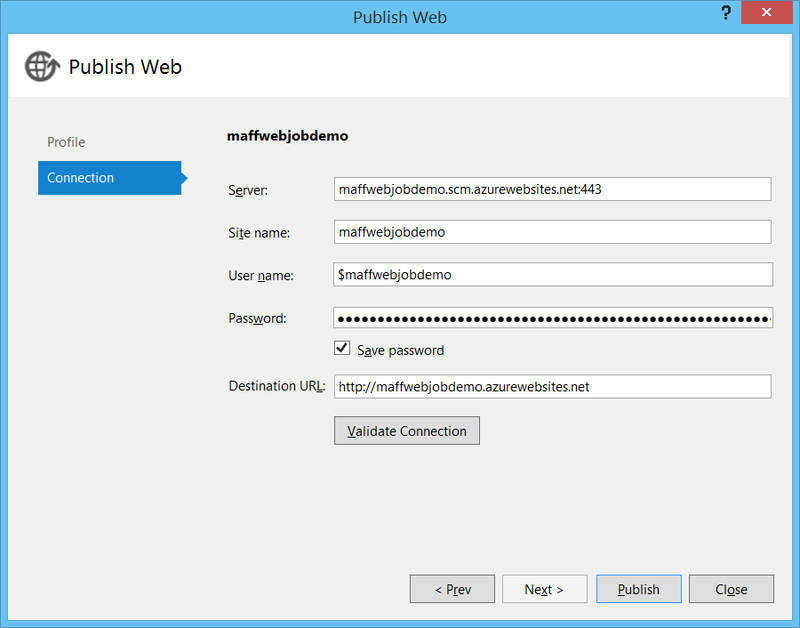 Creating a custom log appender that pushes messages to an #Azure Queue and a WebJob that processes them. So simple! So I’ve been looking for the right opportunity to try these out more for myself and a few weeks ago I was able to! 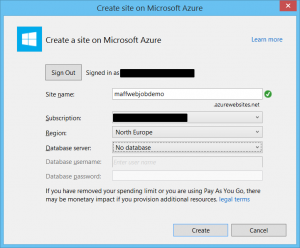 As I said at the beginning of this post, WebJobs can be triggered by adding data to an Azure Message Storage table. 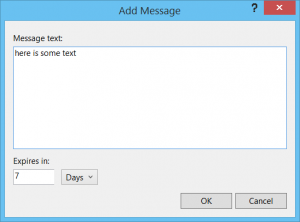 This post will focus on creating a Message Storage table and adding a message to it. In part 2 of this “not yet an epic” blog post series I will show you how to create the actual WebJob and do something when your data is queued up in the Message Storage table. 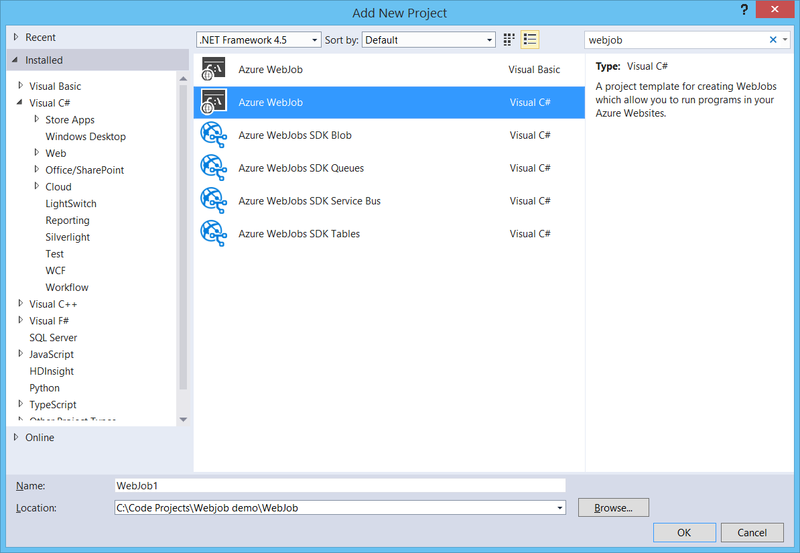 If you haven’t used Azure before, you’re probably going to need to install the Azure SDK so you can access all of this goodness. You may also need to install the Azure Storage NuGet package if it’s not installed already locally. 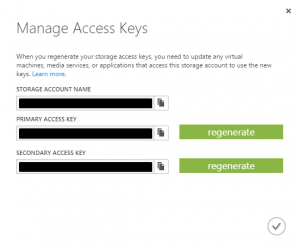 So if you haven’t used Azure Storage before, the first thin you will need to do is create a Storage account through the Azure Management Portal. Azure Storage is billed based on the size of what you’re storing, as well as the number of transactions in and out of the storage. The costs are pretty tiny so for a quick example such as this one you probably won’t even be charged! However if you’re feeling particularly tight-fisted or don’t have access to a credit card at the moment, you can use your local Azure emulator instead (this should have been installed along with the Azure SDK from the previous step). If you do create a storage account in Azure, you will see from the Azure portal that your storage account has 3 services – Blobs, Tables and Queues. Blobs are used to store files, Tables are used for data storage, and Queues are used for storing messages. The service we will be using is the Queues service. Before you write the code to add messages to the Queue storage you need to know two things – the connection string for your storage account and the name of the queue you’re adding messages to. You can actually define this in your code, and if the queue with that name doesn’t exist, you can get your code to create it. We can see that in action when we look at the code in the next bit. WARNING – your message queue name needs to be all in lower case otherwise you (like me) will spend hours and hours trying to figure out why it isn’t working!!! Ok so now we have the boring config stuff out of the way, the interesting code bit is refreshingly straight forward – you can add data to your Message Queue in just 6 lines of code!!! // Penultimate step – create a message and add it to the queue. That’s it – pretty simple eh? In reality though, you probably want to store a message that is a bit more useful than the example above! The good news is that because the message queue stores a string value, you can store serialized objects in there, and they will be deserialized to objects by your WebJob code in the next step. A quick final point to make – you can view the contents of your message queue at any time through Visual Studio’s Server Explorer. 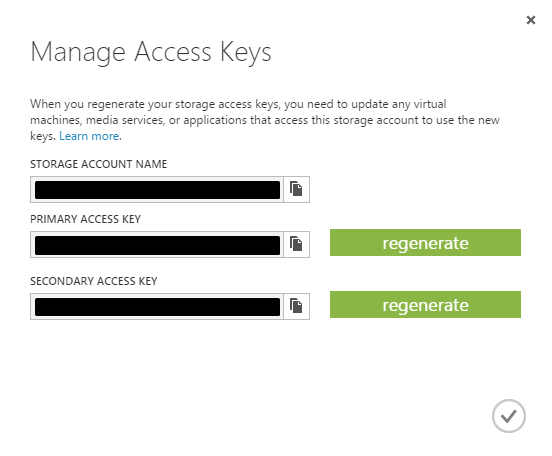 Just connect to your Microsoft Azure account and navigate through to your storage account. You will see the Queues service there and the queue that you just created. Double click on your queue and you should see the message you just added! And that’s all there is to it really – in part 2 I will show you how to create and debug a WebJob to process the data from your message queue. Exciting stuff! I’m a lot more than slightly excited to announce that I will be running my first full-day AngularJS Fundamentals workshop in April! The workshop is happening on Friday 10th April in Bristol, and will be run in conjunction with Develop Me Training – an awesome tech training company that was set up last year to help bridge the technical skills gap in the South West region. So if you’re based in the Bristol/Bath area and want to learn more about AngularJS fundamentals, then come along!